The item Callander Square, Anne Perry, (electronic resource) represents a specific, individual, material embodiment of a distinct intellectual or artistic creation found in Austin Public Library. 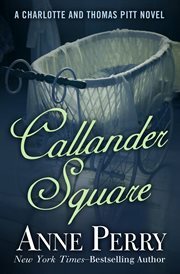 Everyone on Callander Square has something to hide-but someone will kill to keep a secret When two dead infants are dug up in the Callander Square gardens, the upper-class residents dismiss the burials as the desperate act of a low-born girl and resent the intrusion of Inspector Thomas Pitt into their well-ordered lives. Pitt is not convinced that the case should be so easily dropped. Also intrigued by the mystery, Pitt's well-born wife, Charlotte, pursues her own investigation into places Thomas would never have access-the parlors and inner chambers of the mansions on the fashionable square. With her sister Emily, Lady Ashworth, who lives on Callander Square, she delves into the lives and secrets of the residents. Thomas and Charlotte, now expecting their first child, form the perfect sleuthing couple. Elegant closets soon spill their skeletons exposing long-hidden secrets-secrets that could lead even the most upright aristocrat to kill. But will Pitt's keen investigative skills and Charlotte's insights into the workings of high-class society solve the mystery in time to save the innocent residents of Callander Square from the murderer among them?